Question 1 Name the scientist who discovered electrons? Question 2 What are cathode rays? Question 3 what is the nature of charge on cathode rays? Question 4 What is an electron? Question 5 What is the absolute mass and charge of an electron? Question 6 Explain the experimental set for discovery of electron? The electrons were discovered by J.J.THOMSON in 1897. 1)It consist of a long cylindrical tube sealed at both ends and is fitted with two metal electrodes. 2)The electrodes are connected to source of high voltage. 3)The tube is connected to a vacuum pump as to increase or decrease the pressure. 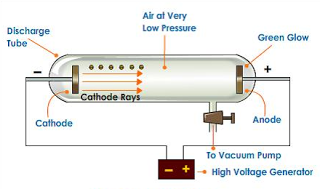 4)The discharge tube is filled with air. He passed electricity at high voltage through a gas at very low pressure taken in discharge tube. 1)When the voltage is high and pressure is 1 atm,no electricity could flow through air. 2)When the voltage is high and pressure is reduced to 1 mm of Hg,electricity started flowing through the tube.Light was emitted inside tube. 3)When the voltage is high and pressure is reduced to 0.001 mm of Hg,walls of discharge tube opposite to cathode started glowing with a greenish light called fluorescence. The fluorescence is due to bombardment of walls of tube by rays emitted from cathode.These are known as Cathode rays.They consist of negatively charged particles called electrons. 1)The charge on an electron is 1.6×10−19 C.This charge is found to be smallest negative charge carried by any particle.So it is taken as unit negative charge. 2)The absolute mass of electron is 9.1 x 10-31 kg .